Belated and blessed Easter prayers. It’s time for a Catholic resurrection. Excuse starting a Catholic Family Podcast with a reflection that starts with me… but I want to start with a story — well, two stories actually. Jump ahead some months and I am now mildly acquainted with the young lady as I have seen her four or five times for hair cuts. She is quite good at this. But in my last visit, I found out she is pregnant by a boyfriend whom she is not living with. They ‘go together’ and have discussed moving in, but she is uncertain about making that kind of a commitment to this guy. I wanted to stick my fingers in my ears to dislodge wax and see if I had heard correctly…. ‘you are pregnant by this fellow and he says he’s ready to be a father, and yet you two aren’t ready to take the step to marry or live together? I bring this up because by now I’ve found out that the blonde stylist goes to a Christian church which she has previously told me about. She loves the pastor because he is ‘funny’ and makes her feel good. And she likes the uptempo Christian pop music. Now let me go to the second story… I know I haven’t given you an ending or some sort of evangelization to the blonde lady. I don’t have a suitable conclusion just yet. Let’s move on. My wife might wink and suggest there’s a pattern as I move into story number two. I have been having some trouble with my knees (a bit too much kneeling you might presume? 🙂 And so I recently had my regular doctor refer me to a young-ish, attractive physical therapist in our town. I knew her reputation from my visits to an elderly care center where she used to work, and in which I bring Communion to the residents. Jumping ahead, at my most recent visit for therapy, by now I’m talking more in depth with the therapist and it comes out that she used to be ‘Catholic.’ At 22 years of age, while in college, she met and fell head over heels in love with a guy ‘she should never have married.’ She wanted to be married in the out-of-doors and she was mad that the Catholic church wouldn’t let her do this. She made the excuse that I’ve heard several times: “That’s where I feel closest to God is outside, in nature.” I didn’t respond to this; I just listened. She said the marriage didn’t last long, except that a daughter came forth from that union. And the therapist is now a single mom, caring for the daughter with some sort of a zodiac sounding name. I mean no disrespect. The therapist asked me what time Easter Masses were — she thought she ought to go ‘make an appearance.’ Oh my heavens. Where to start. What to say? Let’s take the physical therapist situation. She has what is called a doctorate in physical therapy. She is recognized as a true professional in the community. She has gone to two colleges to complete her degrees and specialized training. How could she be this alive in that area of her life while treating Christianity or Catholicism as some sort of abstract theory? How can we who call ourselves followers of Christ allow such a death message to be handed on to our young people? All of this started, of course in a garden. “Oh Adam, it’s okay, take a bite.” And of course today’s pseudo-Christian theorists would remind us that no one would be condemned for simply eating an apple. Or condemned to hell for meat on Fridays like they used to say. And many more of today’s speakers would indicate that the Church is so far out of date about things like giving condoms to kids or not being fair to homosexuals who truly love each other. Or living together before marriage. I have no idea if this column will be read by one person or a hundred. But I submit to you that we Catholics (well, all Christians really) are in need of a resurrection. We are in need of the power of God’s most Holy Spirit to come upon us and to rattle our churches with a mighty wind. A mighty force of awakening. 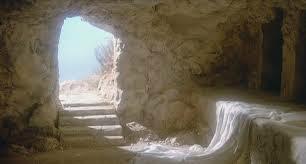 Christ arose. He is alive. Christianity is alive. But some of churches aren’t alive. I’ve been in them. They remind me of what a most holy woman, Lucille (R. I. P.) used to say: before she ‘found’ life in the Church, she thought all the “MASSES WERE FOR THE DEAD and all the HOMILIES WERE FOR MONEY.” More than a sliver of truth in those pablum churches that are allowing the flock to be mostly un-challenged, un-taught, self-catechized and self-directed. And with no real-world life testimony as to what it means to be an on-fire, resurrected Catholic. Many so-called Bible-believing churches don’t fare well in these areas either. With regard to the hair dresser and the physical therapist, I will go gently into these matters. Although I wouldn’t mind hearing your thoughts. But know that in my heart that many of my generation and the one following entered the tomb and they have never resurrected. Myself, for a while included. We need to lay hands on the ‘whatever’ generation of Catholics and bring them back to life. « Minimalism: Heaven Bent This Lent? directing and prompting by example and counsel. asked her pastor what he thinks of her situation. better than that” (or at least better counsel). to start by prompting them to seek?